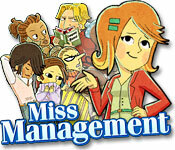 Miss Management is rated 4.5 out of 5 by 34. 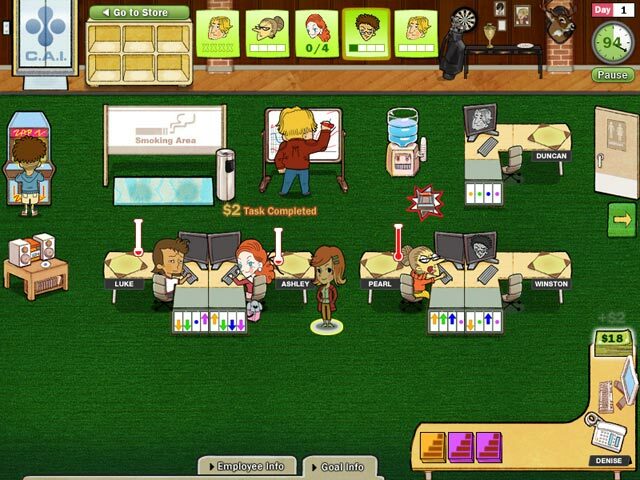 Rated 5 out of 5 by Njsh1983 from Fun time management game I really enjoy playing this game on the laptop. Definitely a great way to waste time. Would be even better if it was available to play on android. Rated 5 out of 5 by beestitcher from Love it! I just discovered this great game. Sure it's old, but it is fun. What a good story. I recognized some of these characters from when I did office work. I even had some of these traits. If you like Delicious, you'll like this. I will be playing it again ... and again. Rated 5 out of 5 by vivoula from One and only I never understood why there wasn't ever a sequel for this game..maybe because the first is one of these games you play again and again and you never get bored.i have returned to it several times.but the still a sequel needs to be done! Rated 5 out of 5 by rachelwoodle from Please bring to MAC format Played this game years ago, loved it and I would absolutely purchase it in a Mac format. Rated 5 out of 5 by kelley2105 from Great game Great game deals with horrible bosses and real work. Rated 5 out of 5 by Kyandy from Still My Fave After 7 Years..... I've played at least a hundred TM games. From Cakes to Roads to Babies to Building. Miss Management is the standard that I hold all TM games to. This holds the Oscar of TM games. 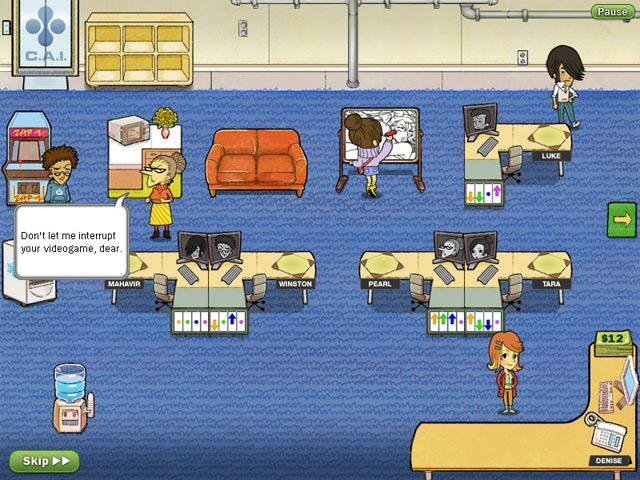 Miss Management has a real deep story with full characters and awesomely unique gameplay. I'm still waiting for a sequel........ Please. Rated 5 out of 5 by LisaM08 from value for money First to to confirm I play all games with the sound off so the 5 stars is just for visuals, no idea about the sound. I love this game. I couldn't sleep one night and played it for a few hours without repeating a level more than once and still had some levels left. This story line is worth a read but after the first level you can skip if you want. I find the levels a challenge after the first few but still fun to play. 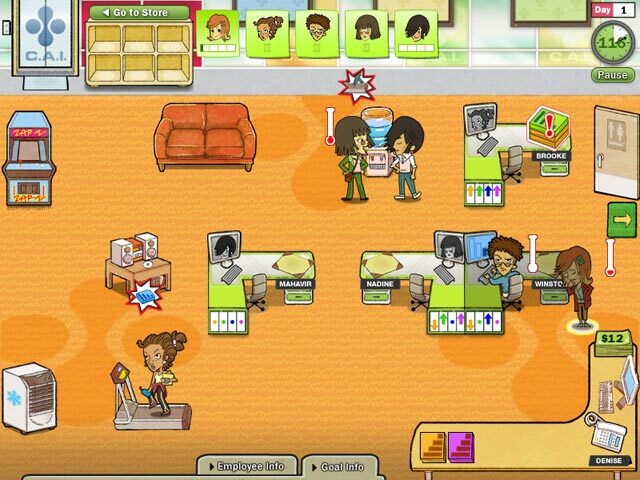 I well recommend any one who likes time management games play the free trial and give it a go. It can take a couple of levels to get the idea of the game but it explains things well. All in all an enjoyable game. Rated 5 out of 5 by Lenaskye from Love this game! Miss management is so great! I have loved this game for a very long time. The story is great, the characters are great, and the ending is very satisfying! You definitely have to earn it, but its well worth it! Rated 5 out of 5 by Cabbagepatcher from Best TM Game Ever I know, I'm reviewing this game years after it came out. It's still my all-time favourite game and I wish they would make a sequel. The goals differ from level to level and so do the characters, so it doesn't get boring. The dialogue in the cut scenes is hilarious. You have to manage the team of office workers, allocate tasks and balance their workload, quirks, likes and dislikes. Some like air-conditioning on, some don't. Some get angry when one guy stinks out the office with his stroganoff in the microwave. Some have a meltdown over too much work, or their colleagues spending too much time at the water cooler. Just like a real office! It does get really hard and frenetic at the end, but the goals are achievable.